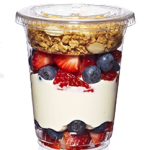 Our yoghurt & dessert containers all have the possibility of an insert cup for muesli, sauces or similar. 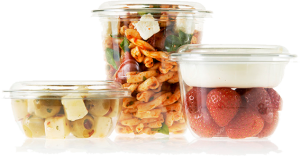 All of our containers are made from PET which ensures that the product will be presented in the best thinkable way due to the clarity of the product. All sizes and shapes are fully printable. For details regarding yoghurt and dessert containers, please contact us or download our product catalogue.